And I launch into my story about having been in another, unrelated business, but that my job meant that I had to appear on the radio quite a lot. Then one day a voiceover agent called into the producer of the show I was on and asked me to call him as he had a proposition. All true, but wait. Was that really the reason why I became a voiceover. Actually, I can trace my fascination with disembodied voices much further back. And that fascination stayed with me right up to the time I myself joined the ranks of the jobbing VO and (I’m glad to say) is still with me today. The real reason I became a voiceover is because I was inspired by so many wonderful voices throughout my life – my voiceover heroes! So I thought it would be fun to name a few of these voices. I’m sure we each have our own personal experiences. Please feel free to comment with yours. As a child it was often the advertising voices that caught my attention although, unfortunately, I didn’t know the names of the artists behind them. But, growing up in the Sixties and Seventies meant TV advertising was heavy on announcer type voices; authoritative but welcoming, deep and dry, a subtle elegance of vowel marking out the voice as someone cultured and trustworthy. I was growing up in a Northern English provincial town, so the vowel sounds especially fascinated me as they just sounded so sophisticated – I hardly heard any non-local accents except on the TV or Radio. The other thing that I noticed very early on was the quality of the sound. It was so different than the voices of the actors in TV series’ or even the newsreaders. What I was hearing of course was the close mic’d perfection that is to be found only in the vocal booth. A rarefied space (with comfy walls) that we VO’s call our lair. There are no annoying reverberations to cause boxiness in the booth, nor are there any other noises. No, in the booth there is only the voice. Patrick Allen was not only a voiceover artist, he was a good actor too, making his debut in Hitchcock’s Dial M for Murder. He also had a great sense of humour and loved to mock the natural pomposity of his voice, as witnessed by his many announcements for the likes of Reeves and Mortimer, the narration for Blackadder etc. This gave him a new audience and it wasn’t long before E4, the newly launched sister channel to Channel 4, got Patrick in to do some channel promos where he would hilariously say things like “Chucking Spunky Tunes In Your Tellybox” in full button-down pomposity – wonderful. Sadly Patrick died in 2006, but the voice didn’t. People so loved these promos that the fantastic Peter Dickson stepped up to the mic, modulating his soft Belfast accent and cramming it into the starched collar left behind by Patrick to wonderful effect for E4 and just about every game show on British TV. Here’s some E4 promos. Patrick first, followed by Peter. Two great voiceover heroes in one! Going back to the 1970’s, it was closedown that I enjoyed the most. Not only did you often get to hear Patrick Allen suavely telling us to stay safe in a nuclear war by hiding under the sofa, it was also when the continuity announcers often showed themselves. In my particular TV region of the UK (Granada and BBC North West) closedown was always a special event. While the BBC would typically play God Save the Queen, over on the more liberal Granada, the closedown would be marked by the previously out of shot voices between programmes suddenly being given a face. A face complete with shoulders and half a chest. It was wonderful so be able to put a face to the voices of Charles Foster, Colin Weston and Jim Pope. They never quite looked how they sounded. Here’s a selection. It was also toward the end of the 70’s that I first became thunderously aware of Don LaFontaine. Now going to see ‘grown up’ movies, i would regularly witness him rattling the cinema seats with his low, rumbling voice. The trailers were often the best bit of the movie experience! Don’s also sadly departed but he left in his wake a whole industry dedicated to shaking us out of our seats in order to grab our attention and tell us about the next film we would go and see. A true VO legend. And no hero list would be complete without one of the warmest British voices in the business, Joss Ackland. A fabulously talented actor, Joss has also been moonlighting as a voiceover for many years and continues to do so even at 85. His voice exudes gravitas and joviality in equal measures and just somehow makes you feel better about the world when you hear it. Channel 4 was probably my most watched TV channel during the 80’s and 90’s. Their blend of irreverence and intelligence was great and their arts programming was, and still is, wonderful. And it was in the 90’s that another continuity voice caught my attention. Up until this time all the voices between programmes, certainly on national networks, had been lovely rich RP voices, but all of a sudden here was a voice filled with warmth and humour, and the personality was greater enhanced by its regionality, a soft midlands voice belonging to Gary Terzza. For me, the output of Channel 4 is forever linked to Gary’s voice. He punctuated the output of the station with his sharp and concise comments; an Everyman voice, but one so expressive and engaging it made you really want to watch the next programme. And so this brings us neatly back to Peter Dickson in all his Patrick Allen post-modernist glory. A circle of voiceover heroes, and the real reason I do what I do. 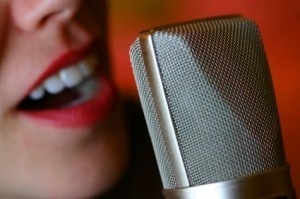 Who owns the voices that made you get behind the mic? T.E.M.P.O. it’s all you need for great sounding voiceovers! T…. Talent well, it all starts here doesn’t it? E…. Environment a good, dead space with no early reflections is essential. M…. Microphone a quality microphone will pick up all those nuances. P…. Pre-amp a nice-sounding Class A mic pre will enhance those velvety tones. O…. Outboard not essential always, but it’s good to have ISDN or perhaps a smooth compressor. Best mic for voiceover? Perhaps the question’s wrong. The harsh truth behind purchasing a microphone is that, although it is generally true to say that the more you spend, the better the mic, it is also true that the margin to which it will improve the reproduction of your voice gets less the higher the cost of the microphone. I’ll venture further; if you’ve already spent a couple of hundred pounds on a decent large diaphragm cardioid condenser mic, then you already have a microphone that will produce a wonderful sound – assuming, that is, that the source also sounds wonderful to begin with. Don’t get me wrong, mic selection can still be important. Using a Neumann U87 can add that sheen that a cheaper mic may not give you (indeed It’s my own mic of choice), but the biggest difference you will ever hear is when comparing the sound from a £50 and a £200 mic. And, of course, even a U87 will sound bad if the space you’re recording in is bad. Plus in voiceover the stakes are raised even further, certainly more than in music production, as the voice is usually the ‘main event’, the thing the listener is focussing on. For this reason it is really important that you get it right, so it’s worth investing a good part of your budget in your recording environment. Your environment is, of course, wherever you set up your mic. This could be the space that you normally record in or it could be a hotel room if you’re travelling, but wherever it is there are a couple of points you’ll want to consider. QUIET! It sounds obvious, but you certainly don’t want noises bleeding into you precious recording, so make sure you have a quiet area to record in. And remember, even though it may not seem loud, low frequency rumble from traffic or road works can easily be picked up by a sensitive mic. A good mic suspension can reduce this very effectively. Another big thing to consider is the noise of the room itself. Unless you have a dedicated vocal booth, an untreated space will generally impart a hollow, boxiness to the recorded sound. This can be cured also, but it requires a little creativity and engineering. A good starting point is to understand how your particular microphone works and from where your mic is picking up the most sound. 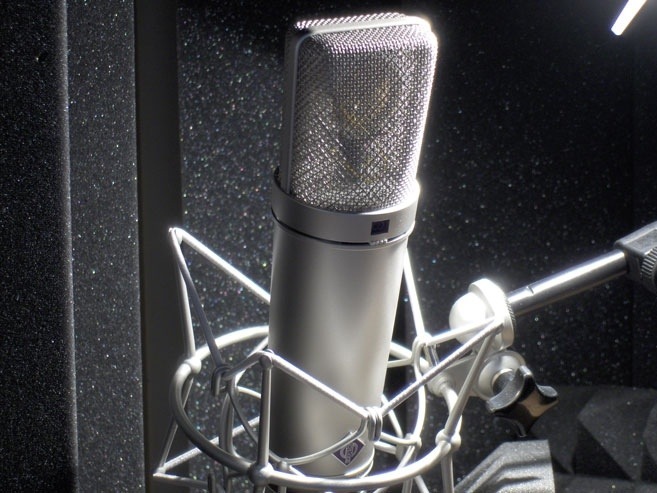 I’m assuming you’re using a large diaphragm condenser microphone although in the world of voiceover, microphone types are almost as diverse as the voice talent. 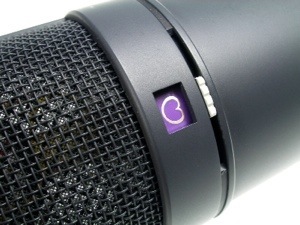 It is generally accepted, however, despite the long lasting popularity of dynamic mics like the Shure SM7B and the Electro-voice RE20 (both of which are frequently used in broadcasting), that the condenser mic has a good balance of sensitivity and frequency response which makes it ideal for bringing out all the vocal nuances of the spoken word. This sensitivity also makes it easy to overload the diaphragm with plosives too so, despite a thousand music videos showing otherwise, a pop shield should always be used. 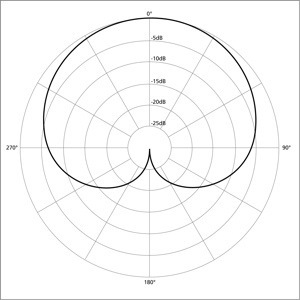 The top of the diagram shows the live side of this side-address mic. As you can see, the mic will reject sounds coming from the opposite side and partially reject sounds coming from the side. This will help in terms of it picking up your voice as the primary source, but it will do nothing to stop the boxiness of the room. As you can see from the diagram below, there is a huge potential to build up massively complex reverberations in an untreated room. Although most of the power will have been taken out of these reverberations by the time they hit the mic, it will lead to an undesirable ‘boxiness’ that should be tamed in order to give a clean recording. There are several products on the market including the excellent Reflexion Filter from SE Electronics that allow you to place an absorbent screen behind the mic, effectively stopping most of the sound waves from leaving the mic position. For those that do get through, you will need to place some type of absorbent material, either foam or even a duvet or similar behind you to the left and right. This will reduce audio reflections on their journey back to your mic. Already with this rather simple set up you should be able to produce ‘dry’ recordings with little room coloration or boxiness. And by getting closer to the mic and making use of the Proximity Effect (where the signal to noise ratio is tipped massively in favour of the signal), you can get that intimate, up close, ‘voice-in-my-head’ effect much loved by producers. When travelling it is even possible to construct a makeshift treated space within a hotel room by imaginative use of soft furnishings. Many a time I have found myself utilising pillows and cushions to build a wall behind the mic while making use of heavy curtains and/or the duvet to mop up the room reflections. This works very well and can get you out of a tight spot when the inevitable big job comes in just as you set foot from the plane (as defined by Murphy’s Law). 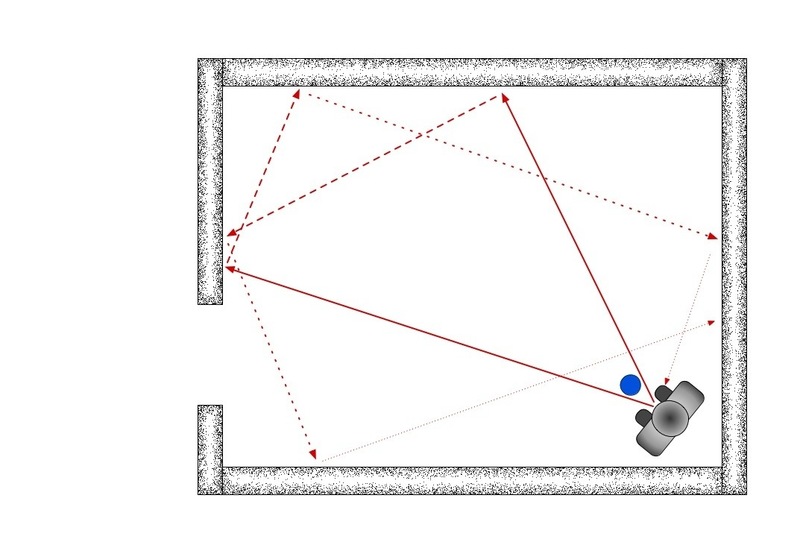 set up you microphone in the corner of your room, close to the apex. Never place your mic in the middle of a room. place a barrier behind your mic to stop (as much as possible) sound reaching the walls of your room. very importantly, have some absorbent material behind you in the apex of the corner as this will mop up any sound reflections that will have undoubtedly got through your defenses. 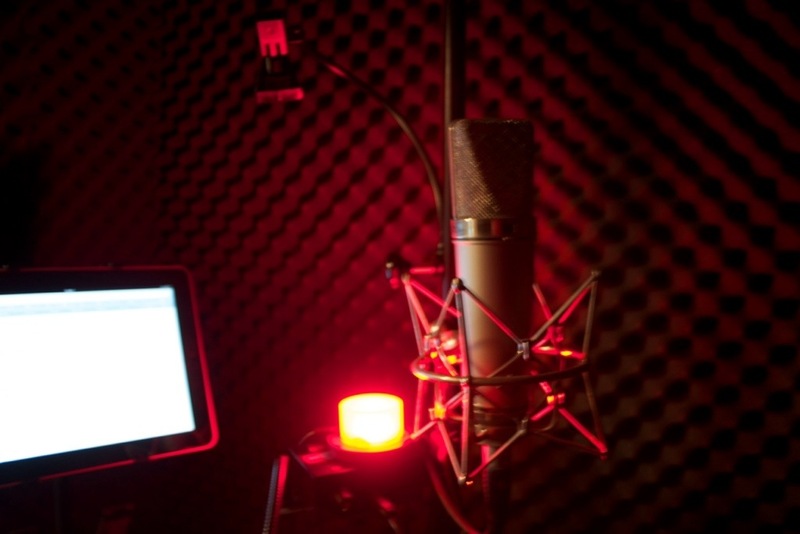 And ‘voila!‘, lovely dry-sounding voiceovers are possible in virtually any room. What’s your opinion on de-breathing? It can add some punch to an otherwise pedestrian vocal performance, it can be utterly crucial to enable you to cram all those words into 28 seconds for a commercial read, and breaths are seldom heard in the 8 or 14-bit world of IVR. Some might say that in the world of VO, no-one hears you breathe. But every breath you take (to quote Sting), also takes a little bit of humanity from the read. It is no accident that in dramatic reads, the breath is celebrated. Indeed a good actor can portray pathos, anger, lust and a whole host of other emotions with a well crafted breath. So what should we as VO artists be doing with our expelled and inhaled air? Well, like most things, it’s all about balance and appropriateness. Too many breaths and the huffing and puffing will distract from the copy; too few and you risk sounding like an automaton version of yourself, a voice-o-matic wordtron. So go ahead, remove all the breaths from that IVR recording (breaths sound horrible in A-law and μ-law anyway), but spare a thought for anything conveying emotion by going easy with the scissors tool in your DAW. The results might just take your breath away! I’ve been thinking about decibels a lot of late. A decibel is, by definition, a 10th of a bel (a little used unit of measurement named in honour of Alexander Graham Bell), and the problem with these dB’s is that EVERYONE wants a piece of them! You see, we in the audio industry use them (generally) to express Sound Pressure Level (SPL), whereas in the electronics industry it’s used to express power ratios. 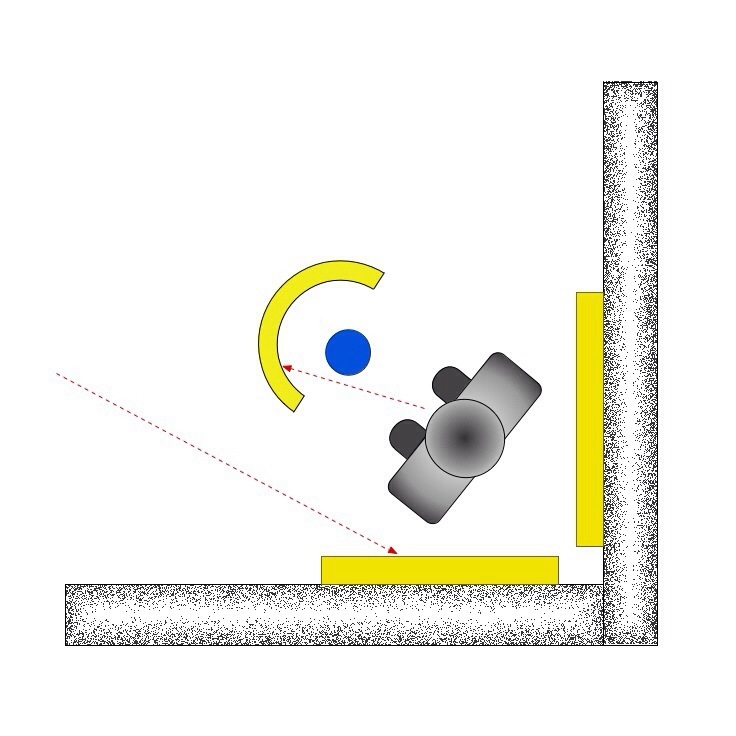 In the world of optics the decibel is all about optical power and loss, but if you’re into video then you’ll know the decibel represents both video voltages and digitised light levels. If all of this wasn’t enough to confuse even the most robust of technical minds, within the audio field there are several different flavours of dB including dBV, dBu, dB SIL, dB SWL, dBm, dBFS and dBTP. But, I hear you asking, the loudness of a sound should be easy to measure, right? So why do we have so many different ways of expressing loudness? 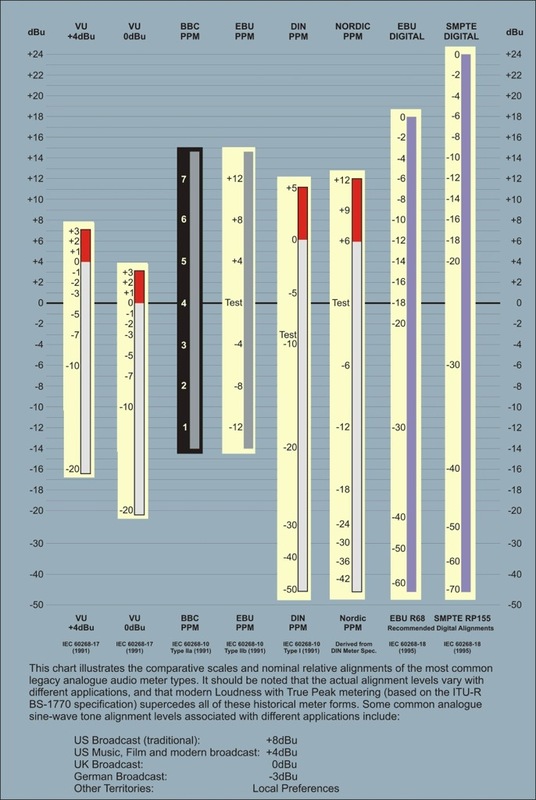 Yes, sound pressure (SPL) can easily be measured. It’s the deviation between normal or ambient air pressure when a sound is present. This, unfortunately, is only half the story though. Any of us who have ever heard a compressor or a limiter in action will testify to the fact that a sound can be made to appear louder (without actually being louder) by virtue of the thickening effect these units lend to the source. And then the complexity of the source signal can also affect our perception of loudness. For these and other reasons, many different scales and standards have been developed over the years. 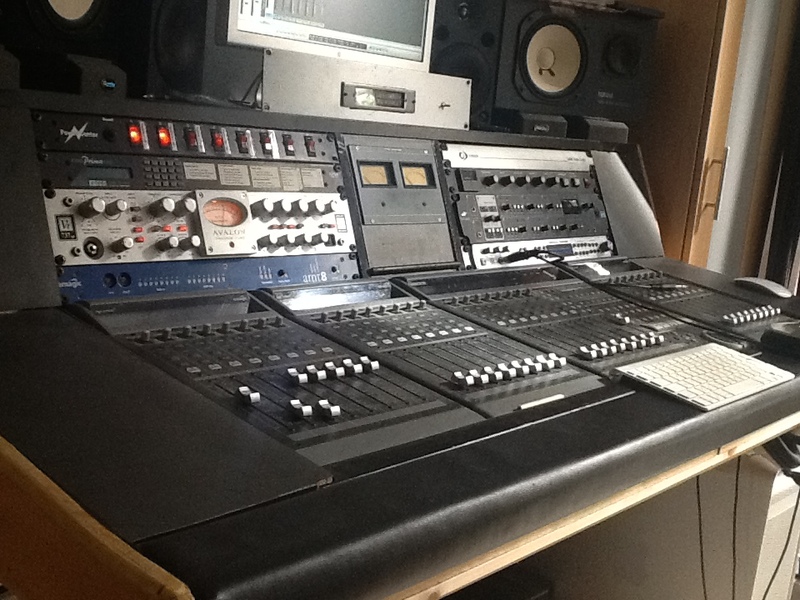 A cursory glance around my own studio reveals thirteen VU meters on various pieces of equipment. The VU or Volume Unit scale runs, in decibels, from -20dB to +3dB and, if you’re using any kind of outboard equipment such as mic Pre-amps etc., it’s quite likely you’ll have one or more of these. The thing about VU meters is that they do not display sound pressure levels but rather a smoothed out display of the signal which reflects ‘perceived levels’. 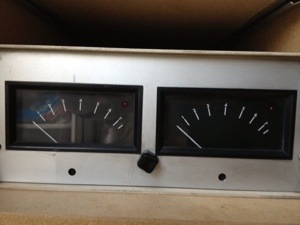 Here’s a couple of my own VU meters. 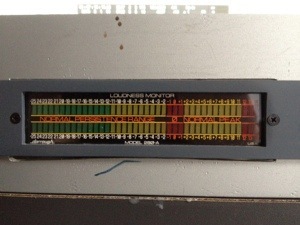 The VU meter was developed in 1939 jointly by Bell Laboratories (dear old Alexander again), NBC and CBS. Originally intended to measure and standardise the varying levels of signal in telephone lines, it was quickly adopted by the recording industry. There is, however, an inherent problem metering using VU’s, especially so within the modern digital studio. The problem with VU’s is that they just don’t move quickly enough to show transient bursts of high energy signals. And in the digital studio if you exceed the theoretical maximum headroom you won’t get warm luscious gentle (and I must say, rather attractive) distortion as in the analogue domain. No, you get gut-wrenching, ears-are-being-torn-off, screaming heebeegeebee distortion – yuck! Even before the digital age it was decided VU’s simply were not really all that useful in audio level-sensitive applications like radio broadcasting. The engineers needed to be sure if the sound was over modulating and so the PPM was developed. Peak Programme Meters act much faster than VU meters. And boy, those needles can really travel! But, because looking at really fast moving needles can be very tiring, they are attenuated to slow down when moving left – when the signal is not so strong. This means they only really show the peaks and do not really represent the overall rise and fall of the material. To further complicate matters, they use a completely different dB scale than VU meters – doh! And worse, there are geographical differences between scales too. 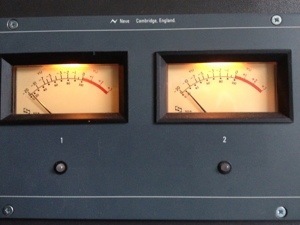 I do some work for the BBC, so I have a pair of PPM meters as the Beeb’s level guidelines are in “BBC PPM”. Here are my BBC meters. Oh, I also have a Dorrough Meter. Now this beast allows you to see both the peaks and the “Persistence Range” (volume units) at the same time! You get dancing lights around the peaks allowing you to check for ‘overs’ plus you get a standard bargraph meter with VU habits. The combination of the two a allows you to see at a glance just how much dynamic energy is in a recording – the closer the two signals, peak and VU are, the more compressed the signal. Alongside all of this I still need to mention dBFS. If you use a DAW you’ll be familiar with this scale. It’s the scale generally used within DAW’s and, apart from 0dBFS has only negative values. Anything negative is under the maximum, anything positive simply clips. Thing is, although all of these methods of metering use the decibel, they all use different scales and, more confusingly, they sometimes use differing scales within the same metering protocol. A quick look at the table below will show you a small sample of the varied ways of measuring the sound that we hear. Also notice that even scales of similar types have different alignment or test points. We all seem to be agreed that we love the decibel, but isn’t it high time we agreed on a single way that we can measure it? A suitably dramatic start to the day and indeed to this, the first blog! Fired up the ol’ faithful console ready for the day’s action and “click”, “pop”, “crunch”, “phhhht” accompanied by much flashing of lights greeted me. The centre section (also known as the most important bit) of the console seems to have given itself a fried breakfast. Incidentally, one of the scripts is for a well known magician who I record for on a regular basis for his live shows. I could do with a little magic – I wonder if he could help?